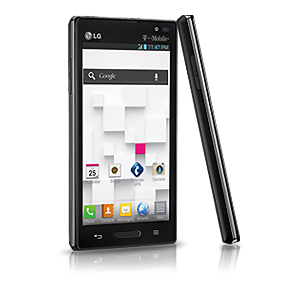 The deal of the week is the LG Optimus L9 4G Android phone for for $174.99 with free shipping from ShopCellDeals Ebay store. The L9 is an up to date Android phone with very good specifications for the price: 4.5 inch 540 x 960 px screen, dual-core 1 Ghz CPU, 1 GB of RAM, 5 MP camera with LED flash, 1080p HD video recording and a front facing camera for video calls. The L9 can be used on T-Mobile prepaid or postpaid plans and most T-Mobile MVNOs without unlocking. T-Mobile will unlock the phone for free for prepaid customers who meet certain requirements. The phone supports AT&T's 3G bands and if unlocked work and get 3G speeds on AT&T and AT&T MVNOs. NET10 (online only) Free shipping on orders of $19.99 or more. Not all phones are available in all areas. Straight Talk (online only) Free shipping on phones $29.99. Not all phones available in all markets. Free LG 620G slide with purchase of a $30 All You Need refill. Free LG 620G slider with purchase of $60 International Unlimited refill. Use promo code FRIEND1 to get $5 off any phone over $19.99. You're right. It was $349.99 early this morning when I wrote this piece. Amazon changes their prices more often than the airlines unfortunately. I've removed the S III from the post as it's no longer a "deal" at list price. There also the Blu Life Play ($229 or cheaper). It comes with earphones, screen protector, and case. And the Blu Dash 4.5 ($139). These are pretty cheap phones. The Blu life series seems to be getting decent reviews from youtube, amazon, and phonedog. They are also coming out with 2 other new phones in the future. The Blu life view and one. Did you read article on phonearena.com about upcoming LG Exalt flip phone and Samsung Stellar coming to prepaid on Verizon?